Buck-a-Reels Mobile Slot at mFortune - Exclusive Review! Buck-a-Reels Mobile Slot at mFortune – Exclusive Review! A Western themed mFortune slot to rule them all, bet from just 2p and win the progressive jackpot! Just in time for your big Easter weekend off, mFortune have launched a brand new game! 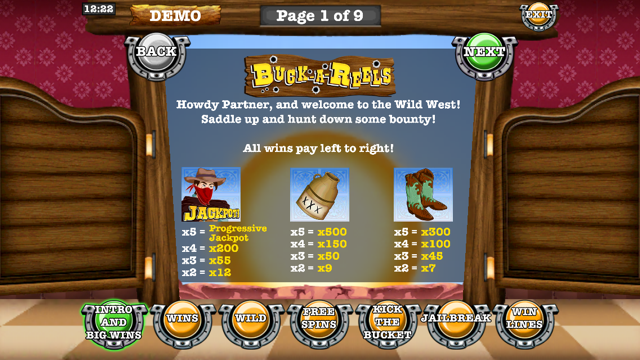 Buck-a-Reels will engage punters with the feisty Western theme, the two mini games that award multipliers left and right, plus the Extra spins rounds and the progressive jackpot too. So if you are after a game that really packs a punch and that you can play from just 2p, then you’ve found the new wild west frontier to conquer. Read our Buck-a-Reels mobile slot review to check out all that this game features. We are always excited about new games at mFortune and we couldn’t be more happy to bring you news of Buck-a-Reels launching today. With a total games portfolio of just 23 titles, no wonder that each and every single new game gets out total and undivided attention. 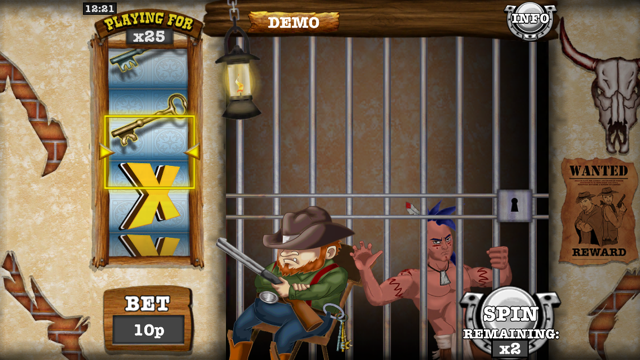 This time, it’s a Western themed machine where your spinning skills will count towards you getting that big win. So can you lasso that multiplier in during the bonus games? Can you tame that wild horse and pick up those Extra Spins? Let’s find out in this Buck-a-Reels mobile slot review. While we do love all of mFortune’s games as they are fun, engaging and rewarding too, they do follow quite a predictable pattern. The bets range from 2p up to £12, which makes it a good range slot for both beginners of mobile slots and advanced players to dabble in and enjoy. Meanwhile, the wins pay left to right and the 15 paylines are rewarding indeed. Here are a few pointers as to what you should be on the lookout for. Although the native Indian, the dandy cactus man, the sheriff, the cowgirl and the 10 and 9 symbols will all payout well, you should really be hoping for the special three symbols to land on your reels. The Cowboy Boots, the Jug of Booze and the Cowboy himself award the largest wins: five Boots will earn you a multiplier of 300x, the Booze will get you 500x multiplier and five of the Cowboys will pay out the progressive jackpot itself. So saddle up and go get yourself some bounty right now! No, we don’t mean the tourist Westerner that you can see all over south east Asia, but a Western movie hero or heroine. Buck-a-Reels is undoubtedly all about cowboys, cowgirls and lots of gun and frontier related rhetoric. The horses buck, the dandy looking personified cactus smiles, the sheriff takes a nap and the backdrop of a Western jailhouse looks very spiffy. If you ask us, t’s commendable that mFortune started to expand the themes within their games portfolio. For a long while, it used to be just the famous Cat & Mouse and Snakes & Ladders games, in addition to the bingo, poker, roulette and the blackjack. Now, you can find all sorts of themes and surely there will be a couple to fit everyone’s needs and wants. We’re just not sure where they are going with the ‘reels’ theme. Starting with Little Red Riding Reels, then Robin’s Reels and now Buck-a-Reels, there’re a lot of reels to be reckoned with. Yes, we know it’s the reels of the mobile slot games they’re releasing, but we don’t see the need to emphasise it over and over. Let’s just hope that for the next game, mFortune can ditch the ‘reels’ and come up with something more innovative at least in terms of the title, if not the features. Quite the typical mFortune game, the developers sure didn’t stray far or let their imagination run totally wild with Buck-a-Reels. That’s why you can expect the typical set of features – the Wilds, two bonus games, a Extra Spins round and the progressive jackpot that’s been launched at £2,000. This section certainly won’t take us long to explain as the Wilds and the Extra Spinsare just the two regular features that players of mFortune have come to enjoy and in some cases love. As usual, the Wilds will substitute for any symbol except the bonus one and the symbol itself is very fitting – two Western guns crossing each other as if in a shoot-off. The bad news is that you cannot win the progressive jackpot if even one symbol is a Wild, but you can trigger a multiplier of up to 300x for a combination of Wilds and Jackpot symbols – stellar! Similarly, the Wilds cannot substitute for Extra Spins to get you some free reel spinning action, but you will surely trigger those yourself as they come by often. Depending if you land 3, 4 or 5 Extra Spins symbols, you’ll get awarded 5,7 and 9 Extra Spins accordingly. Plus, a respective multiplier of10x, 30x or 100x will be applied to all your wins too to boost your profits and plump up your wallet quite nicely! Again, as is usually the case with mFortune mobile slots, there are two bonus features within it. First, Kick the Bucket appears to be a fun way to get yourself some nice and juicy multipliers. You can trigger it with just two bonus symbols on the reels, which make the hit rate pretty good. Often, you’ll get a chance to spin the wheel and hope that in each go, it lands on green. If that’s the case, you’ll more further right on the table that features the same game symbols. For example, getting to the lasso will mean you get a 15x multiplier, while going all the way to the bag of money will mean you walk away with a multiplier of 35xand your head held high. Yet, were you to land on red at any point, you’ll still get awarded the multipliers you’ve accumulated – kudos to mFortune for that. Second, the Jailbreak feature also is quite simplistic in its set up, but that is not to say it’s unrewarding. While the sheriff is taking a nap, you must quietly sneak out of the jail unnoticed and you got three spins on the mini-wheel to accomplish that. Be warned – with each spin, the multiplier that you can win decreases in value, so you’ll want to make a quick dash and get out as soon as you can! How To Win The Progressive Jackpot Of Buck-a-Reels? As with nearly every other mFortune game, a progressive jackpot is launched as soon as the game is online. The ticker starts counting upwards with a small percentage of every single bet placed on the game going towards it and currently stands at just over £2,000. So how can you win it? Well, it’s quite simple when you read about it. You have to collect five Jackpot symbols of the dapper Cowboy on your reels to claim the grand prize. Remember that Wilds cannot be part of the winning combination. Yet, in reality, getting five Jackpot symbols is much harder done than said. You’ll need bucketloads of luck to get that, but that’s it’s called a jackpot for a reason – it’s extremely rare to come by! At this point, the maximum payout of £6,000 is bigger than the jackpot, so it begs the question whether the progressive jackpot should be pronounced as the ultimate prize of the game. Nonetheless, we’re sure that as the game picks up pace and players start flocking to this great Western themed obile slot, the progressive jackpot will swell and reach tens of thousands of pounds. Then, you’ll certainly want to increase your chances of getting a really nice break in your life by winning the progressive jackpot of Buck-a-Reels – conquer the Wild West frontier and get yourself a big bag of money too! mFortune is a great mobile casino, hosting unique games and offering brilliant bonuses and promotions! Claim no deposit £5 bonus now! Buck-a-Reels mFortune mobile casino is highly famous for its excellency in crafting mobile games and Buck-a-Reels is no different. Suitable for download and gameplay on nearly every single mobile phone and tablet in operation today, this game features not just a progressive jackpot, but a Extra Spins round, two bonus games and substituting Wilds too. Plenty to get you excited for Buck-a-Reels, if you ask us! 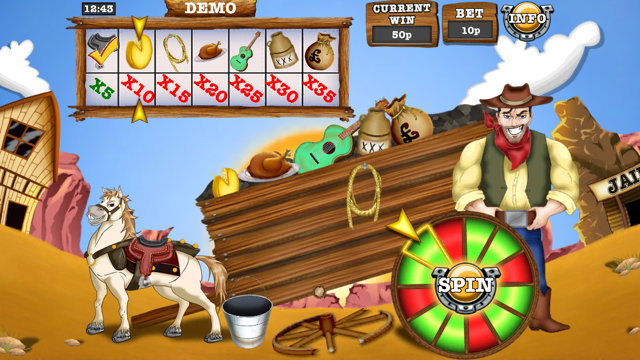 While in many ways this game is a regular mFortune title, the Western themed mobile slot has captured our attention because of the great graphics and the playful storyline of the Cowboy and the Cowgirl, plus the horse which is literally ready to kick the bucket in one of the bonus rounds. So should you give this mobile slot a go? We certainly think so and the deal is sweetened by the fact that you’re given free £8 bonus when you register to check the game out. There is even no need to make a deposit first and you’ll get to keep what you win. What are you waiting for? Get on your high horse and get spinning!